Hi - hope everyone has been having a wonderful week. The weather here in Illinois has been in the 60's this week and mostly sunny. 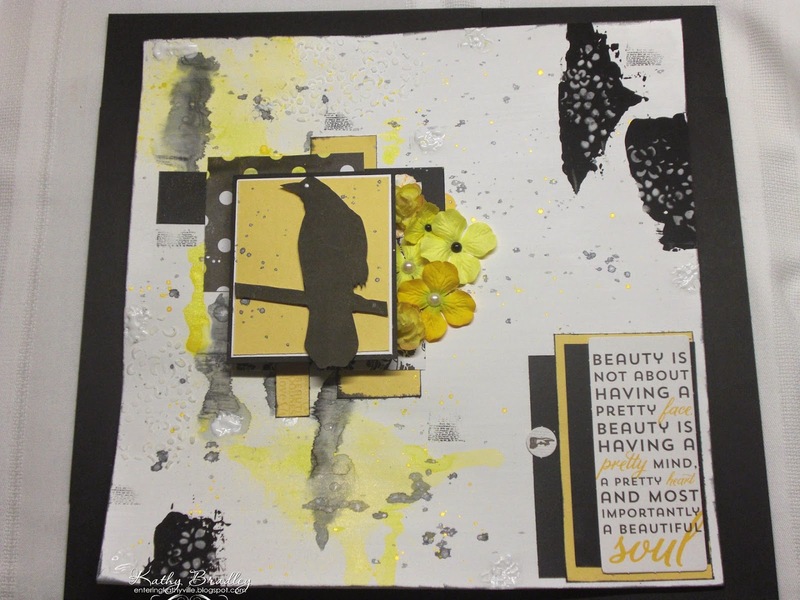 This layout is for a challenge at the Mixed Media Place blog - Exercise 7 titled The Power of One - which is to use 1 color, 1 stencil, 1 stamp and black/white. See below which I took from the blog. Also, there is a direct link under the picture below which will take you to the challenge. - then pick 1 colour - and you can use paint/mists/inks/pencils/beads/glitter/embellishments etc in your chosen color, plus black and white everything as well (for example when choosing a photo). You can use varying SHADES of the one colour you choose, going from dark to light. You can add PATTERN by way of the stamp you choose, patterned papers, chipboard and the stencil you choose. You can also add detail with TEXTURE by way of pastes and gels, fibres, beads and embellishments.Once you start you will find you are not really that restricted, and many creative ideas will become evident. A really fabulous piece Kathy, the black and white with just the one colour make for some real drama. Not an easy challenge that but you tackled it with some real creativity!! Love it. Of course this is a color combo I like and use often. Lots of interesting details. this is gorgeous Kathy and fab new layout you have love it. Beautiful page! Thank you for joining the Mixed Media Place challenge! Great color combo! Yellow-white-black works so well! Thank you for joining the Mixed Media Place challenge!